Hi Bloggers, it's the first Sunday of 2013 so welcome to the first PanPastel challenge of the year and for your pleasure it is an 'anything goes' theme which always goes down well. 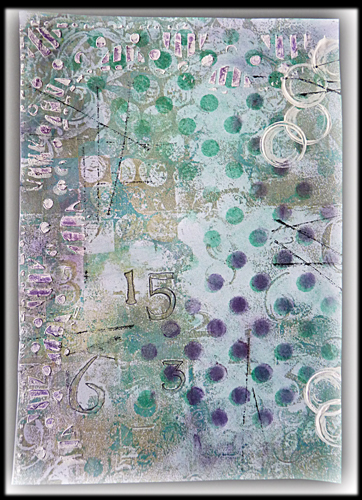 Those who follow me know that I have been experimenting more with the journalling style lately and I have also been using prints I made after Christmas with my new gelli plate. This is another of those and I have added PPs over the top to create more dimension using masks and also used PPs over some gesso layered through a mask. I used the white gesso to stamp the circles as well. The stamp is from Crafty Individuals and called Party Puffin, isn't he just fabulous? I am making this into a cover for a new diary. I hope you will join us again this year, there are lots of fabulous challenges in the pipe-line and there is a trial set of the pans for the winner supplied by our fabulous sponsor Berni at Your Creativity Store. We are welcoming two new members to the team Tracie from the UK and Terry from the Netherlands, I am sure you are gonna love their work so please pop over and say hello. Hope your week 1 went well and that you are finding lots of crafty time. Love this gorgeous cover for a new diary, Brenda...that bird is so lovely and adorable!! 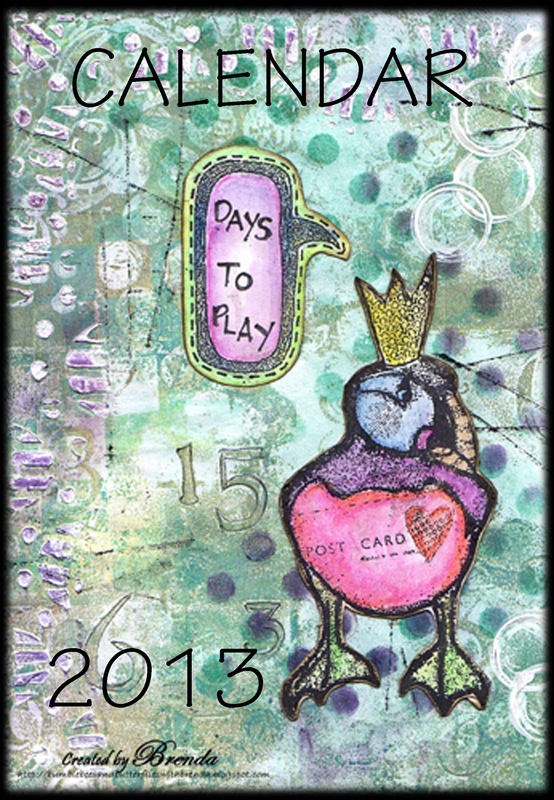 Love the addition of the stencilling on your background and that puffin stamp is wonderful. Oh, Brenda, die Karte ist zuckersüß. oh Brenda this is AWESOME! I would be happy to have you on board with us there! Very creative Brenda, love the colours. fantastic creations, love the backgrounds! I love this new style from you Brenda. just fabulous work. The colours and detail are brilliant. 'ere did you know that Claire has a 'battery operated pencil eraser!! Brenda my friend, I love your art journaling style! I do believe you have talked me into one of those plates. This is beauiful! Hope all is going well and that Becca is still on the road to recovery! Hugs! Oh this is so gorgeous Brenda love the colours and the puffin. He looks so happy on the cover and I think it is fabulous the words you have added to the bubble. What an incredibly rich background! I wish I could sit with you, Brenda, and see how your rock the PPs. It was remembering all your gorgeous work that made me spring for a few sets when DD came to town! You've created a wonderful card, lovely image and wonderful colors. Your new cover looks real cool! Love your background so much! Seems I have to find out the gelli-printing too;) ..and the stamp is genious! Great cover! Gelli-printing, hugh? Heard of it for the first time yesterday at the creative jump starters... a new "must-have" maybe... Anyway - the background is beautiful and the colours too!